Crossing the Blind Forest is a piece for flutes (bass flute and piccolo), electronics and images, composed especially for and dedicated to Camilla Hoitenga, who premiered it in New York in September 2011. It is a form of evocation of Maurice Maeterlinck's famous play "Les aveugles" (The Blind), itself based loosely on Pieter Bruegel famous painting by the same title, while revisiting and developing the flute materials composed by J.B. Barrière for the multimedia show "Deux Songes de Maeterlinck d'après Bruegel" (Two Dreams of Maeterlinck after Bruegel), premiered by Hoitenga in the Festival Les Musiques in Marseilles, in May 2007. In this new piece, the flutist is in a certain way playing the character of the blind people lost in the forest in the theatrical play by Maeterlinck. She is lost in an unknown world, and must exacerbate all her sensations and skills in order to try to survive the dangers all around her. The virtuoso flute playing is challenged by sophisticated electronic transformations, figuring an uncertain fight, whose issue may eventually be left open, undecided. 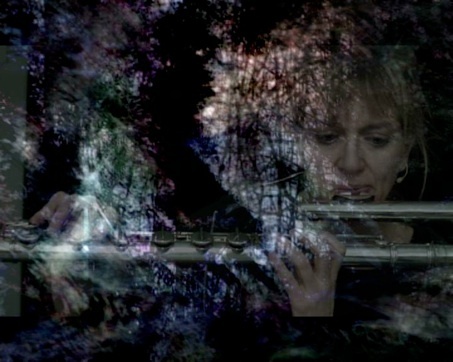 Images, mixing cross transformations of the live performance of the flutist and images of forests devastated by the storm, are meant to represent and accompany this endeavor through sensations. The sound of the flute is transmitted to a Macintosh computer which runs Max-MSP (Ircam/Cycling74), with which all the treatments are realized, before to be spatialized on four loudspeakers around the audience. In the same time, the image of the flutist is transmitted to another Macintosh computer which runs Isadora (Troikatronix), which processes it, before it is projected on the screen behind the flutist. Sounds and images captured and transformed in realtime are mixed and interpolated with pre-recorded sources coming from the same origin. Commissioned by Art Zoyd, with the assistance of Carl Faïa, premiered at Roulette, New York, September 2011.